There’s never any good news about climate change. Not only is it always getting worse – happening faster than we’d thought, wreaking unimagined levels of havoc – but everything we do seems to contribute to it. Why bother changing your light bulbs when your daily commute could illuminate your whole neighborhood? And if you thought driving a car was bad – well, you could drive clear across the planet with the greenhouses gases your Thanksgiving flight home will release. And flying is nothing compared to the damage you’re doing every time you eat a burger! Reasoning that everything can’t literally be worse than everything else, I did a little research and composed a ranking of our actions’ impact on greenhouse gas emissions, and where meat-eating falls on that list. This ranking is rife with assumptions, but see the chart below for my best shot at the average person’s annual CO2 emissions from various sources. 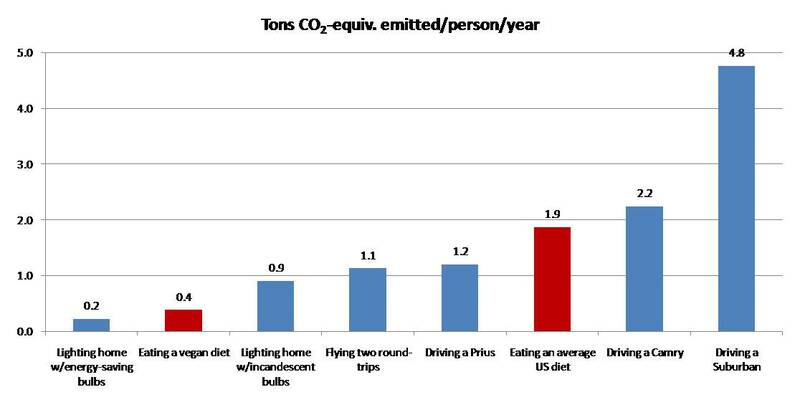 The greenhouse gas savings from replacing the average US diet with a vegan diet are pretty significant, but it’s even better to leave the Suburban in the garage. I find the figures in the chart hard to believe to be totally frank. I bought an arable farm years ago and turned it back into a grass-based livestock farm. The farm has gone from a busy place using masses of tractor power, diesel, oil-based fertilisers by the tonne, tractors to spread it, weed killer in thousands of litres a year, to a peaceful place where little work happens (I’m very glad to say!). And yet I produce the same value in £ terms (I’m not sure about feed value) than it did as arable or would do now even though prices have risen considerably. Also, what no-one ever seems to take into account in the calculations, is what they leave behind after the arable. My soil was so depleted, that even grass would not grow without more fertiliser. But what was really needed was the muck from my cattle, and also from grazing sheep as well. I’m no specialist and I cannot argue on detail, but I really feel the calculations are simply too simple in view of my real life experience. It just doesn’t add up. PS. forgot to say, it will take something like 10 years to get my land back to normal soil where grass will grow without using oil-based products to help it along. Add that into the sums and I think the graph would look quite different, or is it added in? Arable is like taking drugs, the land becomes dependent upon the very things you do not want to see used. Organic isn’t the answer because I have farmer friends who can only produce about half of intensive arable. The real problem is too many people, and most eating too much. Thanks Clive. What’s in the graph above is an average US diet compared to a vegan diet, so the sorts of contributions you’re making are unfortunately no more than a 1 on the tail end of a very long decimal. One estimate has it that only two-tenths of one percent of beef in the US is grass-fed – most of it is feedlot-finished and very resource intensive. More people need to be doing what you’re doing (and the consumer needs to ask for it). What worries me is that people and the media just put labels on things, or they do over here in the UK. So beef is beef, red meat is red meat, etc. Red meat gives you cancer, well as you seem to be aware, not all red meat is the same and we’ve been eating it for millions of years, so there should be a message in there somewhere! Beef raised naturally, especially on land that cannot produce food realistically in any other way is a positive advantage in every way I can think of except that at the end of the day, you end up slaughtering animals and that is another subject which as a livestock farmer, and an animal lover, is a difficult issue and one close to my heart. Beef raised in feedlots is a problem not because of the beef but because of the volumes required in that it relies on arable production to sustain it. Cows should not be eating grain. I suspect that within the calculations, what resources go into the production of the feed for the cattle is the problem, not the cattle themselves. It is the way they are fed to satisfy over-demand, not the animals. Eat less meat and produce less but good quality, natural meat is the way for me. There is almost a bit of a frenzy over here, hugely sad, and sick, “kill a cow and save the planet” I have seen reported. No need to respond, just having my say, well done with your blog.